I’m not usually the person to write about the miracles of modern food science. I usually write about its opposites: food heritage, food history, and what has become the cult of fresh, local and organic. Today I want to take a minute to appreciate industrial food. Getting pregnant, I’ve realized over the last few years, is not always something in your control. It wasn’t in ours. I’d spent so many years trying to avoid getting pregnant that it seemed like it pregnancy would be inevitable, with the precautions removed. It was not. And there was not a lot I could do about it. Well, we could do it, but it, did not always help. I began to feel like something was wrong with me. Maybe I was not healthy enough. Maybe I would get pregnant, and stay pregnant, if, somehow, I was healthier. I decided to eat more kale. Being healthy is important, but this kind of magical thinking is the result of believing I can control things that I can’t. I didn’t get pregnant, but I did eat lots and lots of dark leafy greens. And omega-3 filled sardines, and beets and tomatoes, and salmon, and organic grass-fed beef. Foods high in good fats and folic acid. Nuts and berries and legumes; delicious, healthy, fresh, local and organic things. I shopped and cooked for my desires and my hopes and myself. Surprisingly, it didn’t help. Last fall I’d almost given up. We’d been trying for nearly two years. It was time for more invasive action, or adoption, or a different plan. Maybe I this motherhood thing wasn’t meant to be: I began to taste that thought. I gave up on kale and started eating burgers, and dessert, and put on 5 pounds. And then, that month, I was late. And then still the next week, and the week after that. But being pregnant—I’d learned—did not mean I was going to have a baby. Things happen, and after everything that happened, I was too afraid to test, or talk about it, or tell. But, some things you can’t hide. I am happy to report, more than happy actually, and also scared as hell, that it is now Week 15, and things are still going well. Fresh, local and organic are still a great thing, and a good goal, but until a week or two ago, Campbell’s Chicken Noodle Soup was all I could keep down. No kale, absolutely not sardines, nuts, berries, or fruit. Everything I thought was healthiest made me violently ill. The doctor said this was a good sign. My hormone levels were high. That afternoon, I ate another can of Chicken Noodle Soup. I’ve never loved the stuff. It was industrial, commercial: I only ate it when I was ill. 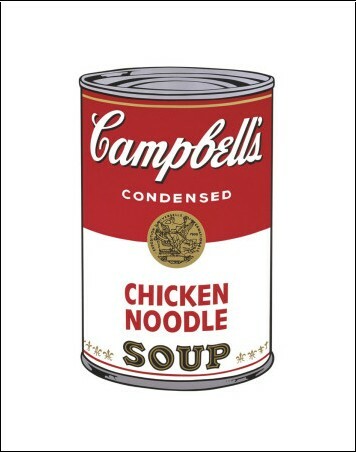 But when I could not eat anything else, I could eat Campbell’s Chicken Noodle Soup. It tasted the same way it always had, and it was safe, and sanitary, and I knew I could find it wherever I went. And that seemed like a miracle as well.